The one thing that we’d been waiting for, a delivery of rock samples for my post-grad geology course, had been lost for a week in some courier black hole. On Monday morning, with our southerly already blowing, they reported that they had tried delivery and failed, so I got them to hold the parcel at their depot. Although we’d sold the ute, we’d hung on to the motorbike for precisely this eventuality and so we took a last four-hour commute across Sydney afternoon traffic to pick it up. With the bike now abandoned at the marina (enjoy her, Elizabeth! ), there only remained the little task of preparing Pindimara for sea. We hauled the Walker Bay dinghy up onto the fore-deck and tied her down. This is the first time that we’ve tried this without deflating the RIB. The RIB is removable, and in the past we’ve let it down or taken it off to give us more deck space, but the Walker Bay dealers have been more than a little incompetent about replacing our lost pump valve adapter (it’s been over a year now!) and we haven’t been able to source one from the internet, so we don’t want to go to the hassle of trying to borrow one at the other end so that we can pump it up again. In any case, we’ve designated the Walker Bay to be our inshore “life raft” if things get really nasty, so it’s better if we can leave it inflated. We lashed the oars inside before tying it down, and mounted a knife inside the anchor hatch in case we need to cut the dinghy free in a hurry. We pulled down our Ampair wind generator and converted it to tow mode, and mounted the Hydrovane rudder (which has been out of the water for antifouling) and sail (which has been stored below while we’ve been on the mooring to minimise UV damage). Finally we mounted the jack stays on either side of the deck, and went around the cabin securing all the bits and pieces so that they wouldn’t fly out and hit us on the head at sea. We were ready to go! Except for one little thing. We were expecting it to take us 19 hours to get to the next deep-water destination, Port Stephens, and we prefer to do our in-shore and reef navigation in the light. This suggested a mid-morning departure, so we went to bed. The following morning, we checked the BOM (Bureau of Meteorology) and Tuesday was still forecast light southerlies, changing to northerlies on Wednesday and Thursday. It really was time to go. Bronwyn cooked up a hearty oatmeal breakfast while I prepared the boat and then, coffees in hand, we motored out of Gibson Marina for the last time. It was a strange feeling, looking back and watching the familiar shoreline recede into the distance. 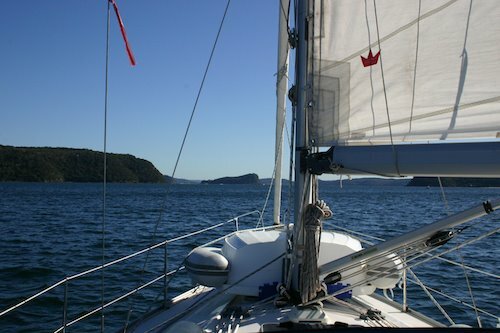 Almost everything we know, we learned here in Pittwater. Not only did we do our initial ‘Competent Crew’ qualification here, but over the years as we learned to sail our own boat, we have known joy and laughter, sunshine and storms, frustration and anger and even fear. We sat in silent and companionable contemplation as we chugged out towards the heads. Passing under the Barrenjoey lighthouse, we hoisted the main and the friendly light Southerly took us out to sea. We’re off. 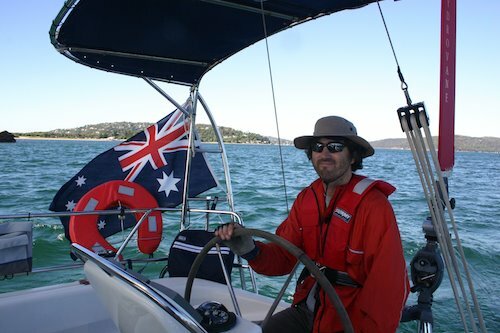 This entry was posted in Australia, Oceania, Travel, Voyage of Pindimara and tagged Sail on 2009/03/16 by Reinhard. Great to here you’re on your way………….hope to catch up somewhere along the way……….probably early on around April I would say. We are in the Sandy Strait right now.will spend this weekend in Hervey bay and the next couple of weeks in Bundy. The we will be moving on again; further north. Hi. Adrian told me about your odyssey. I was at Palm Beach on Wednesday and saw a white sail going north and thought is that them.